There are good years and lean years, up years and down years. According to the National Bureau of Economic Research, in fact, the average length of the ‘good period’ in which the economy expands during this up/down cycle is 56 months. That’s followed by an average 11 months of economic contraction, upon which the whole cycle starts again. Well, it’s been TEN good years now. After the worst crisis since the Great Depression wiped out trillions of dollars of wealth around the world, most developed economies hit bottom in March 2009… and then started slowly inching their way forward again. So that’s technically 119 months of economic expansion… which means the world is way overdue for a significant correction. Even if you ignore economic history, there are signs everywhere. Nearly every major asset class around the world– stocks, bonds, real estate, etc.– is selling near an all-time high, and being priced at levels that just don’t make sense. The US stock market’s Price-to-Earnings ratio, for example, which is a measure of how much investors are willing to pay for every dollar of a company’s profit, has rarely been higher. Other stock market ratios, like Price-to-Revenue, Price-to-Book, Cyclically-Adjusted Price/Earnings, have rarely been higher. Even Warren Buffett’s preferred metric, which measures the value of the entire stock market relative to the size of the economy, has only been this high one other time in history– just before the dot-com bubble burst in 2000. Just about any way you slice it, the stock market is overvalued. It’s the same with bonds, whose values rise when interest rates are low. Well, interest rates were literally at their lowest levels in 5,000 years of human history for most of the last decade. And even though rates have risen a bit in the last 2-3 years, there are still trillions of dollars worth of bonds in the world that have NEGATIVE yields. Companies whose finances are sinking faster than Virginia Governor Ralph Northam’s approval ratings are still able to borrow billions of dollars at practically nothing percent. Even bankrupt governments are able to borrow money at unbelievable terms. Argentina notably borrowed billions of dollars back in 2017 by issuing a ONE HUNDRED YEAR bond. Bear in mind that the country had defaulted several times just in the previous few decades. But countless investors with their goldfish memories still lined up, and there was far more demand for the bond than Argentina’s government could accommodate. Over in the Land of the Free, the average checking account now pays just 0.06% interest, while the rate of inflation is hovering around 2%. This means that anyone who tries to be responsible and save money for the future is WORSE OFF after adjusting for inflation. Not that anyone has any savings anyhow. According to Federal Reserve data, the median bank balance in the US is barely $3,000, while a recent survey from BankRate showed that 23% of Americans have almost no savings at all. Meanwhile, debt levels continue to rise. Government debt is at an all-time high around the world, led by the US government’s prodigious $22 trillion debt, far larger than the size of the entire US economy. Corporate debt is at an all-time high. Student debt is at an all-time high. Consumer debt is at an all-time high. Mortgage debt is also at an all-time high, now totaling $15.3 trillion. And that’s because property prices have hit another all-time high. Housing affordability, meanwhile, is at its lowest point in a decade. You get the idea. Just about everything is overheated. And the economy is overdue for a big correction. This economic correction is inevitable. It’s only a question of when: this year? Next year? You may remember that the last financial crisis in 2008 hit just two months before the national election in the United States. The economy instantly became the ONLY election issue that mattered. 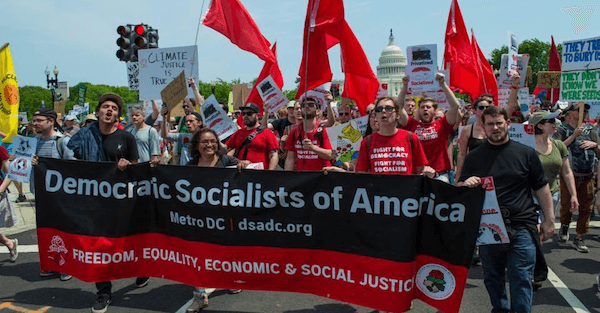 It’s entirely possible that this will happen – a big recession and market correction hits just before the 2020 election, catapulting a legion of socialists into office. Bear in mind that an economic crisis is like any other crisis: an opportunity for politicians to capitalize on people’s fear to pass dangerously ambitious legislation that wouldn’t stand a chance under normal circumstances. Think back to 9/11. People were so panicked and terrified that they didn’t notice or care that the government passed Orwellian legislation like the USA PATRIOT Act. Well, this time around there are already countless socialists clamoring for 70% tax rates, wealth taxes, etc. And if they’re swept into office by a major economic crisis, they’ll have free reign to pass their entire agenda– higher taxes, nationalized healthcare, debilitating business regulations, etc. This is a very real possibility: we’re overdue for a recession and the socialist are already waiting in the wings to seize power. It’s strange to say, but I’m HOPING that a recession starts soon; if there’s a recession this year (instead of next), then it would likely be over before it becomes a major election issue. But as we used to say in the military, hope is not a course of action. And that’s why I’m preparing for what I think will be the greatest redistribution of wealth in modern history.